Save £1,000’s with the K2 Konnect DIY Conservatory system which has been designed for home owners with no fitting experience. 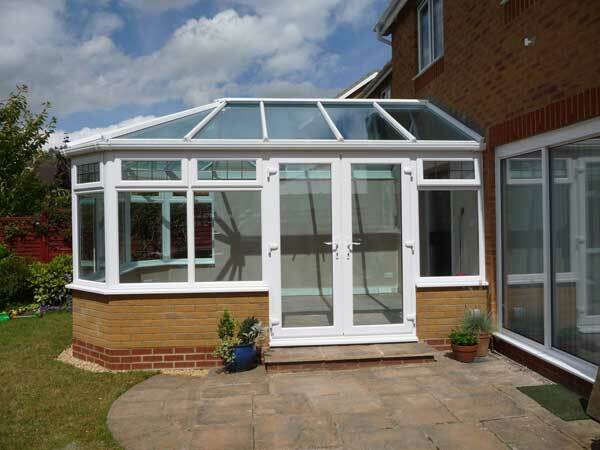 Lean-to conservatories are often referred to as Garden Rooms or Sun Lounge conservatories and with a single pitched roof they can be the most economical of all conservatory designs. 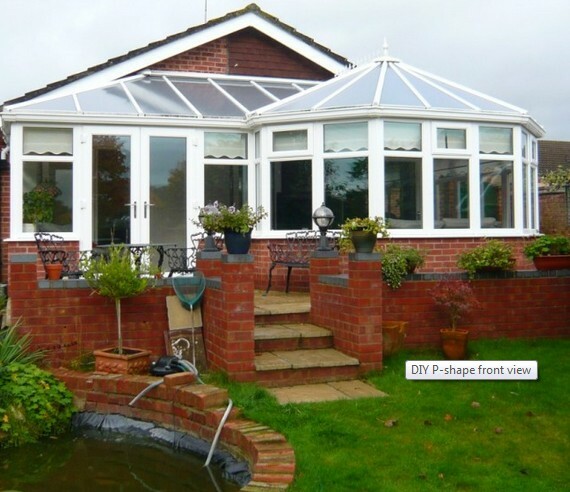 Lean-to conservatories are generally square or rectangular in shape and although the customer who built the conservatory shown on the left decided to have double doors to the front elevation, we often recommend that the doors should be on the side of a conservatory. 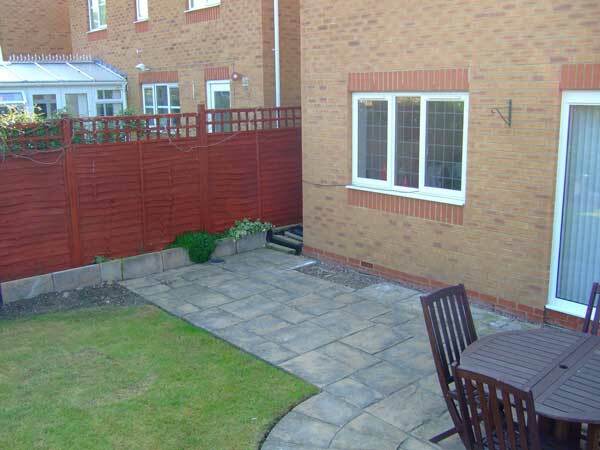 This maximises the amount of usable space inside the conservatory for furniture and to provide access from your home into the garden. 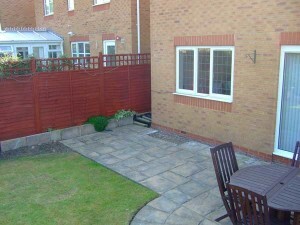 Prices include VAT @ 20%, delivery anywhere on UK mainland and a 10 year guarantee. 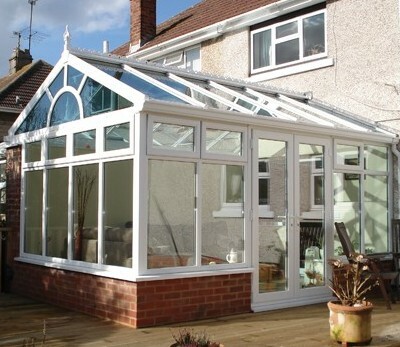 Edwardian conservatories are one of the most popular designs of conservatory because they are square or rectangular in shape but have a more detailed and attractive roof structure than Lean-to conservatories. 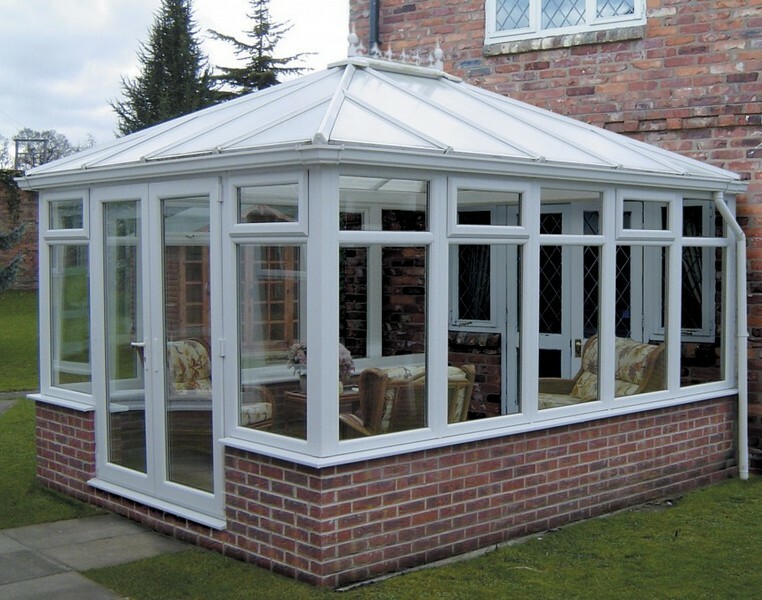 Edwardian conservatories have a high central ridge which will give your conservatory a much greater sense of space than the lower roof in a Lean-to conservatory. Our Edwardian DIY conservatory kits for the bases, windows, doors and roof are easy to assemble for the average DIY enthusiast, even if you don’t have any conservatory fitting experience. 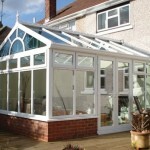 Victorian conservatories have a high central ridge and a bow front which can be built in three, five or seven sections. 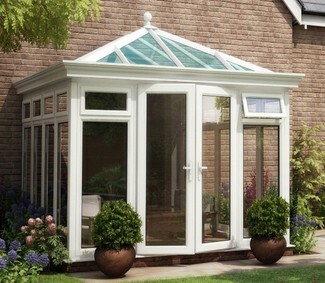 The position of the door from your conservatory into the garden is important due to the shape of the curved front of Victorian conservatories Unless you build an extremely large Victorian conservatory, the doors into your garden should be positioned on the side so that you don’t compromise where you can position your conservatory furniture. 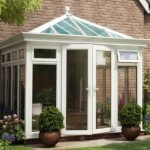 With that in mind, Victorian conservatories are still one of the most popular conservatory designs. Conservatories with a gable front wall are becoming ever more popular with householders due to the vast feeling of space that the high ridge offers. Gable conservatories are ideal for north and east facing homes because the glazed gable front ensures that the maximum amount of light is allowed into the room that your conservatory is attached to. 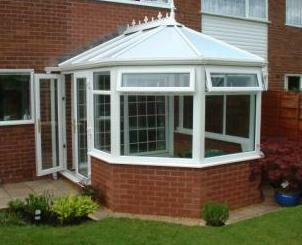 The angled gable front wall is often decorated with a sunburst design to enhance the conservatory’s aesthetic qualities. 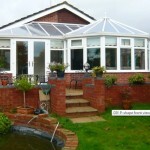 P Shaped conservatories are designed by connecting two styles of conservatory together to form two room spaces within one conservatory. 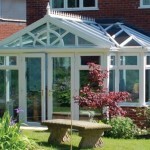 In the illustration on the left a Victorian conservatory and a Lean-to conservatory with a hipped end have been combined to form the classic P Shape conservatory design. 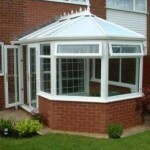 They are ideal for larger properties and even though there is more involved in the construction of a DIY P Shaped conservatory than most of the other styles, the principles are the same, it’s just a larger conservatory. 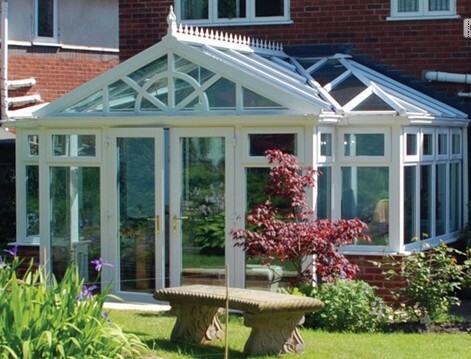 Although most styles of conservatory follow a particular pattern based on the floor plan and the roof shape, we can provide you with a bespoke DIY conservatory, the design of which can be limited more by imagination than technical possibilities. 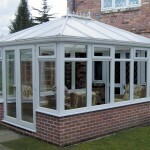 By linking together the basic designs of Edwardian, Victorian, Gable or Lean-to conservatories, we can provide you with your ideal and uniquely bespoke conservatory. You can incorporate classic design features which will leave you rest assured that it is unlikely that there will be another one like it anywhere. The Capella DIY Conservatory style Orangery is a new design which perfectly blends the traditional features of Victorian and Edwardian Orangeries with ‘easier to build’ uPVC conservatories. Timeless Orangery features such as ornate corner posts, deep gutters and decorative fascias combine with an Edwardian conservatory roof to provide the appearance of an attractive Orangery without complex lantern roof structures and the higher cost. 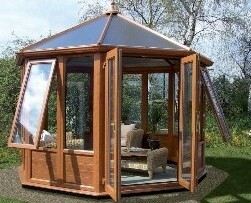 uPVC Garden Buildings by K2 Konnect are available with finishes in either White or Golden Oak and in a choice of three shapes; square, rectangular or octagonal. DIY Garden Buildings can be used as a playroom for your children, a home office or simply a room to ‘get away from it all’. 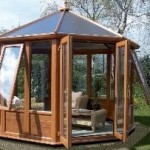 You can choose from fully glazed Garden Buildings or for more privacy, specify solid panels at low level. K2 Konnect Garden Buildings come with a choice of polycarbonate sheets or heat reflective toughened glass sealed units in the roof. 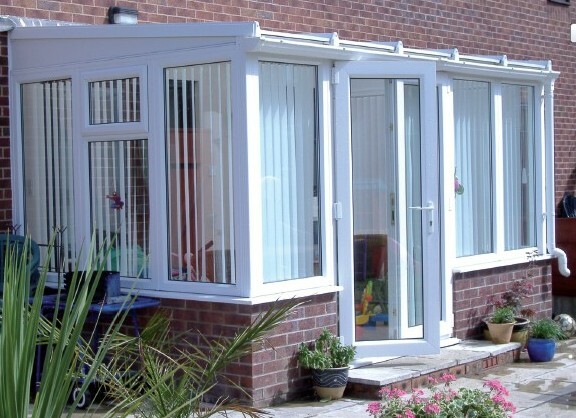 The Durabase™ DIY base works and dwarf wall system is a cost effective and time saving solution for DIY conservatories of all sizes and shapes, and it carries the renowned British Board of Agrément certification. Set up by the Government in 1966, the British Board of Agrément (BBA) is the U.K.’s main authority offering approval and inspection services to manufacturers and installers who supply the construction industry. The BBA’s certification and inspection services are backed by Local Authorities, Building Control departments and the major trade associations in the UK construction industry. The Durabase™ system for DIY conservatories is a bespoke steel base and modular wall, manufactured to individual specifications. 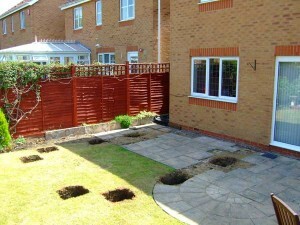 It takes a fraction of the time that a traditional base will take to install. Durabase™ arrives in kit form and it provides a strong, firm and safe foundation for your DIY conservatory. 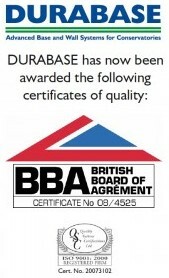 Durabase is suitable for both the professionally constructed conservatories and DIY conservatories. 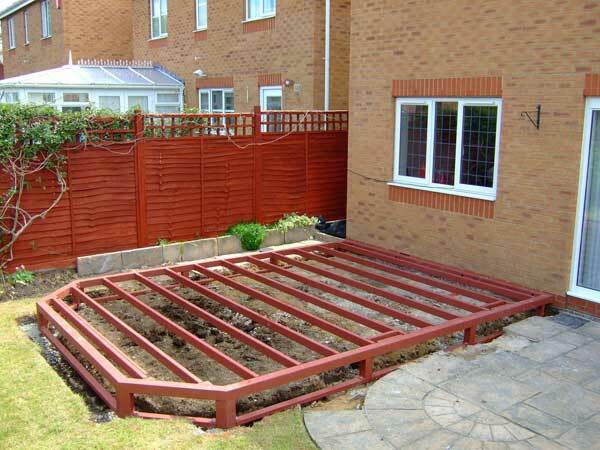 Other than a number of concrete pads to support the steel base, there are no excavation or concrete foundations to install. The Durabase steel base sits on concrete pads and is bolted to the house wall. 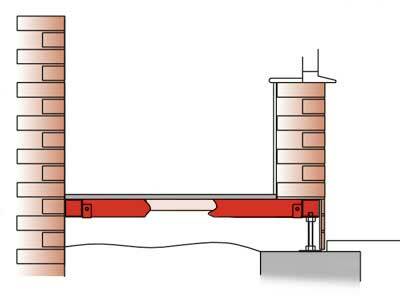 The external cill of the conservatory sits on the outer beam, an insulated floor is installed and the exterior of the base is finished with brick-faced skirting. The Durabase steel base sits on concrete pads and is bolted to the house wall. 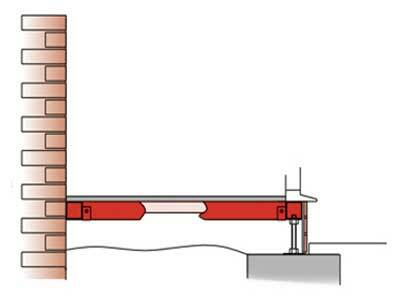 The modular wall has a galvanised steel frame with genuine clay brick facing tiles bonded to a profiled building board. 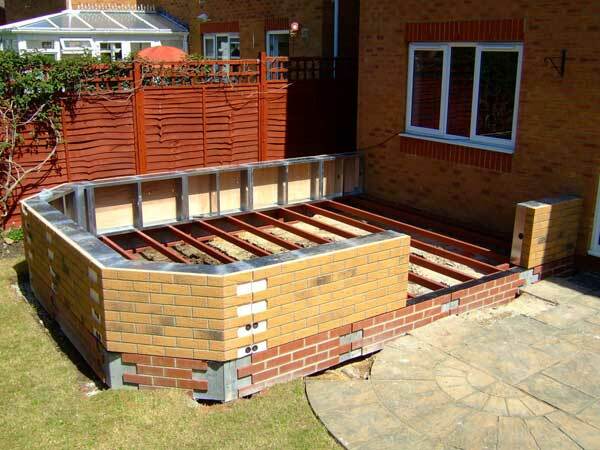 The hollow galvanised steel frame is designed to hold and conceal plumbing and electrical supplies, and insulation. The K2 Konnect™ system of conservatory windows, doors and roofs means that your DIY conservatory can be built without any drilling or screwing. 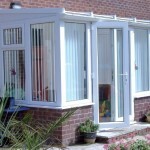 The Konnect™ DIY conservatory system is relatively easy to install and the individual panels come ready for assembly.